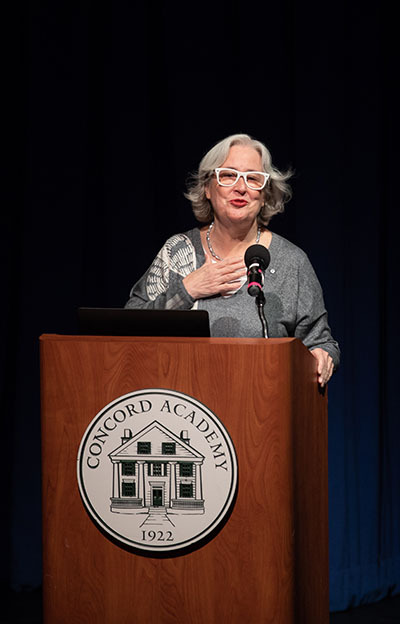 The morning of November 8, hours before Patsy Aldana ’64 delivered her 2018–19 Davidson Lecture remarks at Concord Academy, she seized an opportunity right here in Concord, Mass., to meet misinformation with facts. Eating breakfast at the Colonial Inn, she overheard a fellow diner repeating the rumor that a migrant caravan on its way from Central America was being paid to come to the United States. She knew she had to speak up. “You know, that’s really not true,” she told him. “These people are coming because they’re desperate, and they’re not being paid at all, and you should know better than to say that.” She wasn’t sure she had made a dent in his certainty — they had quickly turned back to their respective meals — but Aldana viewed speaking up as a moral obligation. “I really don’t think we can allow people to lie about what’s happening in the world,” she said, prefacing her remarks at CA. “It’s hard to do it, but I think we have to stand up for the truth.” The talk she delivered in the assembly was grounded in history and, she stressed, well-documented and based in reality. Aldana also drew on her personal experiences in Guatemala, where she was born and raised before attending Concord Academy. A good deal of information may have come as a surprise to some students, such as the fact that the United States is the only UN member state in the world not bound by the UN Convention on the Rights of the Child, a human rights treaty applying to all children under the age of 18. “Needless to say, we are living through a time when the rights of the child are being violated all over the globe,” Aldana said. “The treaty was aspirational.” But Aldana said it is still shocking to the rest of the world that the U.S. has not ratified this convention. Aldana began with a broad historical overview of the Northern Triangle of Central America, which comprises Guatemala, El Salvador, and Honduras — as she said, “three of the most dangerous, and poorest, peacetime countries in the world.” Going back to the great civilizations of the Maya and Nahua people, she followed the fortunes of the inhabitants of this area through the devastating contact with Europeans in the 1500s, independence in the early 1800s, dictatorships, repeated 20th century U.S. invasions to protect commercial interests, military coups, repression, and retreats from social progress, through the most heated period of the Cold War, from the late 1970s to the early 1990s, when the people joined the armed struggle after traditional political systems had failed to alleviate poverty, inequality, hunger, and injustice. “Peace finally came in the mid- to late 1990s,” Aldana said, “but the impact of the war and the violence and destruction it caused are underlying causes of the emigration from these countries that we are seeing today.” And despite America’s defining role in the region, particularly under President Reagan’s crusade against communism, the United States had no Marshall Plan as it had for Germany and Japan. “The U.S. simply walked away,” she said. Aldana then turned to the situation today. “What else has happened that is causing people to take their and their children’s lives into their hands and flee north,” she asked, “in what from the outside seems more and more like an absolutely doomed attempt to make their lives better?” Aldana gave many reasons: the drug trade, and the catastrophic backfiring of the War on Drugs; gangs and the senseless death they inflict on communities; femicide and violence against women and girls; repression of protest against mining industries; and poverty and hunger, driven by income inequality as well as climate change. She discussed three groups of migrant children at risk. Unaccompanied minors are making the highly dangerous journey alone or accompanied by human traffickers known as coyotes. Children are arriving with their parents, either in small groups or, driven together for safety, in the so-called caravans, who continue to be at risk of separation from their parents. American-born children of parents who have been living in the United States for decades, either undocumented or with protected status that has now been revoked by the Trump administration, are — though they are U.S. citizens — now seemingly also at risk for deportation. When Aldana planned to to give her talk at CA, even just six months ago, the situation for immigrants and asylum seekers looked a lot more stable. Now, Aldana described it as “truly chaotic.” She showed pictures of private, profit-driven immigration detention facilities, now tent cities for thousands, and two-year-old non-English-speaking children forced to represent themselves in immigration court — the only court in the U.S. in which children and adults are treated the same. Time ran short for Aldana to finish her talk, but she shared resources for CA community members interested in taking action to address the terrible realities so many children are facing. Among them are major international agencies such as UNHCR, UNICEF, World Food Program, and, along the border, Catholic Charities. Others are legal service organizations including Kids in Need of Defense (KIND) and the Refugee and Immigrant Center for Education and Legal Services (RAICES), and organizations using books to address trauma, such as IBBY Reforma. And she believes in the importance of supporting civil society organizations in Central America — for example, La Biblioteca de los Sueños (Library of Dreams) in San Salvador, El Salvador (more information from IBBY) and the Rieken Community Libraries network in Guatemala and Honduras. Aldana spoke later that evening in the Moriarty Athletic Campus field house about bibliotherapy, addressing the role of the International Board on Books for Young People (IBBY) in bringing books to children in crisis in Venezuela, Indonesia, Lebanon, Gaza, Colombia, Haiti, Chile, Pakistan, Japan, Afghanistan, and Iran, and the creation of the Biblioteca de los sueños in El Salvador, which was conceived of, built, and is now receiving children, all in one year. “Reading saves lives,” Aldana said. 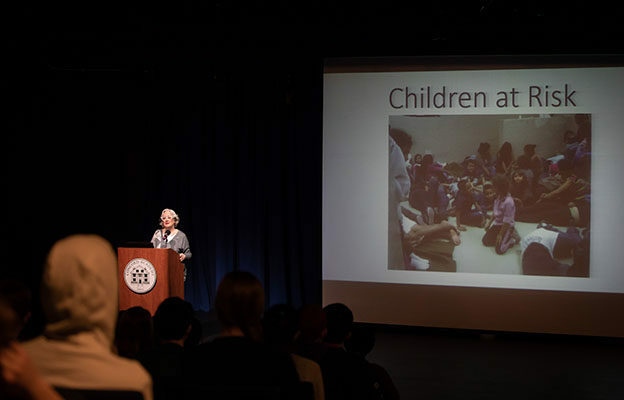 Left: Patsy Aldana ’64 speaking at Concord Academy about children at risk. Right: Aldana speaking with a CA student after giving the Davidson Lecture. 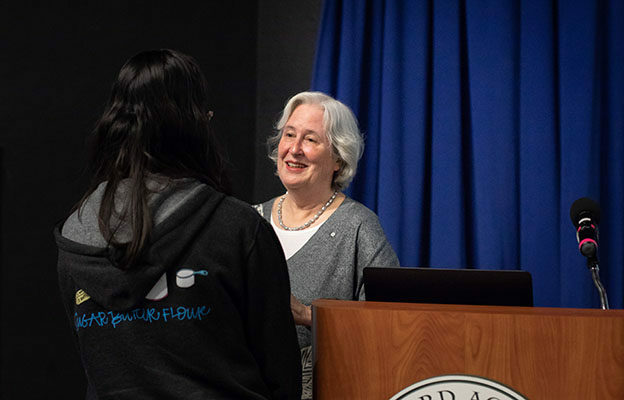 Patricia Aldana ’64, the founder of Groundwood Books, was born and brought up in Guatemala and educated in the United States at Concord Academy and Stanford University. 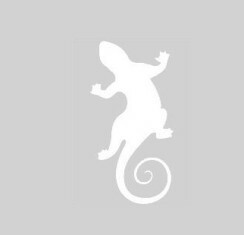 Groundwood Books, founded in 1978 and based in Toronto, publishes the highest quality books for children. Groundwood was recently named children’s publisher of the year for the Americas at the Bologna Book Fair. Aldana has been publisher emerita of Groundwood since 2012. She has been president of the Association of Canadian Publishers; president of the International Board on Books for Young People (IBBY) 2006–2010; president of the IBBY Foundation (2010–); co-chair of the National Reading Campaign Canada (2009–2016); and chair of the Hans Christian Andersen Award Jury 2016, 2018. She has been an active member of the IBBY REFORMA Children in Crisis project working with unaccompanied Central American children coming to the U.S. and on projects in Central America with libraries. She has been the International Collaboration Consultant for CCPPG, China’s leading children’s book publisher 2013–2018, and is now publishing a list of international children’s books for Greystone Books. She has won the Freedom to Read Award from the Writer’s Union of Canada and the Canadian Library Association Les Fowler Freedom to Read Award. She received the Special Book Award of China in 2016 and was named to the Order of Canada in 2010. The Davidson Lecture is a distinguished, endowed lecture series, established by Mr. and Mrs. R.W. Davidson in 1966 in honor of their two daughters, Anne E. Davidson Kidder ’62 and Jane S. Davidson ’64. 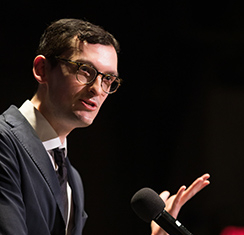 This lectureship has brought a wide array of accomplished speakers to CA, including Dr. Helen Caldicott, Jonathan Kozol, Robert Pinsky P’94, Doris Kearns Goodwin P’84, Susan Minot ’74, Danielle Lee ’93, Philippe von Borries ’97 and Justin Stefano ’98, and most recently Kim Williams P’08 ’14.